It seems that just overnight, all the trees have begun to show off their beautiful fall colorings.Our neighborhood is now filled with trees like this one. Coral. Gold. Magenta. We have almost 50 trees on our little half acre. And many of the leaves that drop will be used to cover and mulch our garden for the winter. Trying to make use of the resources we’ve been given! What would you call this amazing color?!? I’d call it vermilion. Beautiful! I’d just call it beautiful! Looks like rich pumpkin to me! 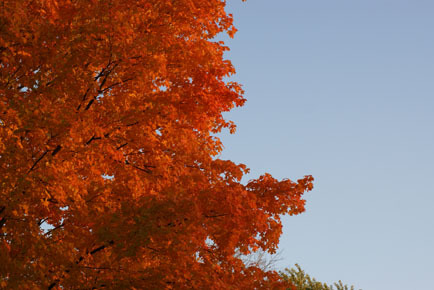 I call the beautiful fall trees “fruity pebbles” – they remind me so much of the cereal colors from when I was little. They’re all jewel tones…. This is my favorite time of the year. My daughter now calls them fruity pebbles trees which I think is adorable! Fire. You know, the color of wood as it burns in a fire place when it is at its hottest. Something like the burning bush that did not burn must have looked like. Living in Tennessee the beautiful season change of fall is our reward for making it through another L-O-N-G extra hot summer this year. I have a wooded area behind my house and it’s beautiful. As one of my children once said a long time ago “it’s like God has a paintbrush”. I couldn’t have said it better. just did my first round of raking today. Still have 4 trees that look just like that! I hope they keep their beautiful leaves for another week or two!